↑ "Israel Central Bureau of Statistics, Population, end of 8/2014". 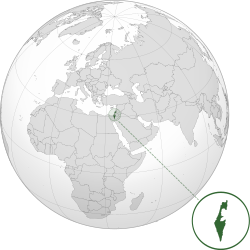 Israel Central Bureau of Statistics. 22 अक्टूबर 2014. पहुँचतिथी 5 जुलाई 2015. 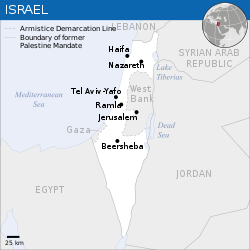 ↑ "The 2008 Israel Integrated Census of Population and Housing" (PDF). Israel Central Bureau of Statistics. 28 दिसंबर 2008. पहुँचतिथी 5 जुलाई 2015. ↑ 3.0 3.1 3.2 3.3 "Report for Selected Countries and Subjects". International Monetary Fund. अप्रैल 2014. पहुँचतिथी 5 जुलाई 2015. ↑ "Distribution of family income – Gini index". The World Factbook. Central Intelligence Agency. पहुँचतिथी 5 जुलाई 2015.